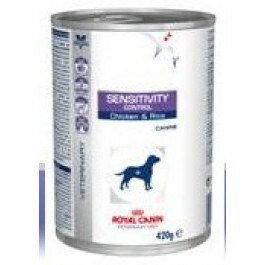 Royal Canin Sensitivity Control Chicken & Rice is a complete dietetic feed for dogs formulated to reduce ingredient and nutrient intolerances. This dietetic feed contains selected sources of protein and carbohydrate. COMPOSITION: meat and animal derivatives (chicken 52%), cereals (rice 12%), derivatives of vegetable origin, oils and fats, minerals, various sugars. ADDITIVES (per kg): Nutritional additives: Vitamin D3: 135 IU, E1 (Iron): 14 mg, E2 (Iodine): 0.65 mg, E4 (Copper): 4.5 mg, E5 (Manganese): 4.5 mg, E6 (Zinc): 44 mg.
ANALYTICAL CONSTITUENTS: Protein: 8.5% - Fat content: 6% - Crude ash: 2% - Crude fibres: 1% - Moisture: 72% - Essential fatty acids: 2.1% - EPA/DHA: 0.28%.